For World Routes Academy 2013 BBC Radio 3 has teamed up with SOAS, University of London, to combine expertise, ideas and knowledge in order to further understand how traditional music is transmitted orally across generations. Launched in 2010 the BBC Radio 3 World Routes Academy aims to support and inspire young world music artists by bringing them together with an internationally renowned artist in the same field and belonging to the same tradition. The scheme targets forms of music and musical skills that are under threat to help preserve them. 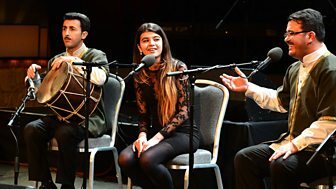 BBC Radio 3 appointed 17 year old singer Fidan Hajiyeva as its 2013 World Routes Academy mentee and paired her up with mentor Gochaq Askarov, who is based in Azerbaijan, and is regarded as as the crown prince of Azeri classical Mugham.